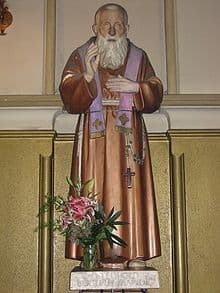 St Leopold was born in Castelnuovo di Cattaro, Croatia. He was disabled which left him with speech and other severe physical difficulties. At 16, he joined the Capuchins and professed his final vows in 1888. His ambition was to be a missionary in Eastern Europe but his disability prevented him. Instead, he was appointed to a parish in Padua from 1906 until his death. He devoted his life to prayer and penance. Much of his day would be spent in the confessional meeting people, offering the sacrament of reconciliation and giving much sought after spiritual guidance. Throughout his life, he suffered greatly from arthritis and other health complications. He died from cancer aged 76. His Feast Day is the 12th May, the day of his birth (30th July in Roman martyrology). Pray for us that we will regularly seek the mercy of God through the Sacrament of Reconciliation.